In case you have missed my week-long coverage of São Paulo Gay Pride weekend, below are links to all the posts about the parties and the parade. Make sure to check them out. 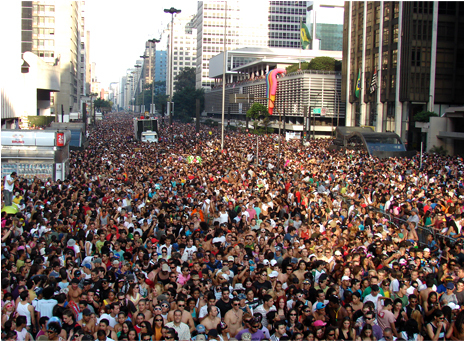 5 Million At São Paulo Gay Pride Parade? And here are videos of the parade last Sunday from the top of the Manhunt float, courtesy of Aimee (DanceMusicDiva). For more videos of the parties and go-go boys, visit Blog Made In Brazil on YouTube. Picture of the parade by Pedro Marra for ParouTudo. THANK YOU GUYS!!! I HAD THE BEST TIME AND CAN'T WAIT TO COME BACK!!! Aimee is one of the newest best talents out there be great to have her play at the event. I am so proud of the job Aimee "DanceMusicDiva" did at the parade in Sao Paulo for 5 million people. Hope everyone that did not go, get to hear her very soon. aimee was a diva. great job and keep it up. come to los angeles when you can. hugs! I was at pride for the parade and at Gods party to hear Aimee "Dancemusicdiva" and she was incredible. Can't wait to hear her again. Aimee "DanceMusicDiva" is a force to be reckoned with. What a wonderful job she did.The music rocked and the people seemed to have a wonderful time. Aimee ; Hope Montreal welcomes you soon. I saw shes playing alive!! shes the best!! Aimee is AMAZING.....when can we get her to Fort Lauderdale? ....how bout if we BEG? One can only hope Alegria is in her future. Great job! DJdancemusicdiva(Aimee Newman)showed what a real musiclover she is,she got the crowed and us in a festive mood by playing top tunes after top tunes,she's was amazing and was one the highlight of the day.....u go girl!!!!!! beijos. Sao Paulo Pride 2008 was an amazing experience. The Parade, the largest in the World was a showcase of very animated floats and happy people showing love for the Gay community. Among them Dance Music Diva onboard the Manhunt float kept us dancing for hours with a set that was pure energy. How can we get her to spin on our parties in the USA? She is a great talent! Hats off for a job well done girl! Aimee was superbe and created a loving atmosphere during her set she played so well....We want her back. Aimee was awesome at the ManHunt float! Without her, the parade wouldn't have been complete! You were awesome DanceMusicDiva! I loved Aimee's set on the manhunt Float! She really rock the parade! Hey nice videos, nice set...I've also seen the others in youtube they are awesome... are you comin' to mexico city anytime soon? Hope you do! I´m so proud of you girl you dont have idea!! Our star will shine a lot baby!! According to the videos I've heard...I want her at my pride ASAP!! Fierce! ! I just can't forget Dancemusicdiva's amazing set on Pride. It was full of emotion! She ROCKS!!! And had a great energy!!! it's so lucky to be Brazilian. wish i could join brazilian gay pride someday. thanks to put this info.